Revolutionary technology in the sewer cleaning industry is crossing the pond after the 2017 acquisition of Premier Oilfield Equipment by KAISER AG, a company based in Liechtenstein. Those who attended WWETT 2018 were able to preview this sharing of experience and technology when the newly formed KAISER Premier presented the first U.S.-made AquaStar, which garnered buzz with its unique system for water recycling. Retaining the entirety of its Premier Oilfield Equipment workforce, KAISER Premier will continue to focus on hydrovac vehicles while also taking on a leading position for recycling sewer cleaning vehicles within the North American market. Thanks to KAISER AG’s global operations, a wealth of experience and synergies will be able to generate clear regional value. To facilitate this share of information, U.S. employees will be able to travel to Europe and employees from Europe will be able to do likewise. These interactions will spur innovations. The AquaStar, according to Weber, is the culmination of over 35 years of development that has been tested and adapted to several diverse markets, including Russia, Finland, Germany, Switzerland and Africa. Through lessons learned, KAISER AG has made the AquaStar reliable, user friendly and easy to maintain, making it an ideal addition to cities’ toolboxes to care for their sewer systems. The telescoping boom is designed with shared hose routing for suction and jetting hose. “It only takes one trained operator to run it effectively,” Weber said. 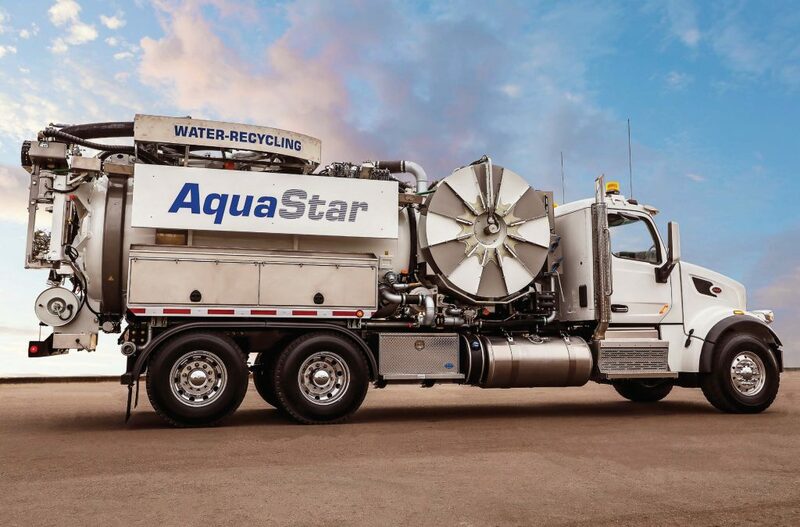 The AquaStar’s water recycling feature offers up to 10,000 gallons in fresh water savings daily versus conventional sewer cleaning. The highly automated operation system allows the operator to focus on the work at hand. The full-feature radio remote control offers the option to move freely away from the vehicle. The full-color LCD information display delivers clear feedback on current performance parameters. Data such as jetting hose meter counter, tank filling degree, vehicle weight and component status are transmitted directly to the radio remote control and presented in graphical form on the display. The control of the water pressure at the jetting nozzle also makes sewer cleaning considerably less difficult. Due to the “intelligent structure” concept and its control system, noise emissions are extremely low. Not only does this process give water savings, it also increases productivity as the operator can work for hours with the onboard water — eliminating the need to travel to refill with fresh water. 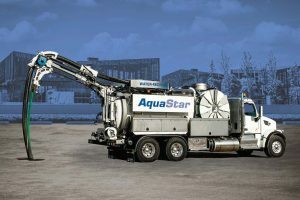 Unlike other recycling sewer cleaning systems that use multi-stage filtration systems, the filtration on KAISER’s AquaStar uses the innovative one step Rotomax filter system. 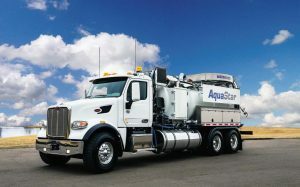 Customization and a variety of features also allows AquaStar to be specifically adapted to customer’s operations. Onboard data analysis is another benefit that is leading the industry. With it, data from the unit is transmitted directly to the radio remote control and presented in graphical form on the display. The display and control of the water pressure at the jetting nozzle also make sewer cleaning considerably easier. Diagnosis is also made easy with KAISERteleservice, which allows a service engineer to remotely log into the vehicle control system via a modem and access all current data and perform the necessary troubleshooting. “Once familiar with it, the overall response is one of surprise about how easy and reliable the AquaStar is,” Weber said. As a means to introduce customers to the Aqua-Star and other KAISER AG products, KASIER Rental was formed by KAISER AG to provide customers with an opportunity to try out units. Weber noted customers can become more comfortable with the technology before making large capital investments. With both short-term and rent-to-purchase agreements available, customers can get a full understanding of how KAISER’s technology will benefit their operations. “Long term, KAISER Premier will bring over products offered by other manufacturers under Kaiser AG,” Weber said. Dan Weber holds an executive record of developing and managing scalable, fiscally responsible and sustainable growth strategies. He has 30 years of employment experience with Fox Photo, Alcoa Aerospace, Alcoa Automotive and Jack Doheny Companies. He earned his bachelor’s degree in business administration from the University of Wisconsin — Oshkosh. Weber sits on two boards and is an equity partner in a chemical and explosion business. Prior to joining PREMIER Oilfield Equipment, Weber led Jack Doheny Companies to 18 consecutive years. During his tenure, he managed 23 wholly owned service centers, seven dealership locations and a rental fleet of 750 vacuum trucks. To learn more about KAISER Premier and its parent company KAISER AG, visit www.kaiserpremier.com and www.kaiser.li. In addition to KAISER Premier’s Colorado location, KAISER AG has facilities in Liechtenstein, Italy, Finland, Slovakia and Austria.